It is never too early to start preparing for the most wonderful time of the year. Here at Frank you can find everything you need to have the merriest Christmas of all time. 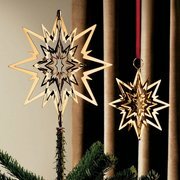 You will find Christmas decorations to decorate your interior (and exterior!) for the Holidays. Lighten up your home in the darker winter days with one of our many Christmas lights in many different colours, shapes and sizes. From traditional candle-shaped lights to twinkling lights in different colours, you can find all these products at Frank. Besides these twinkling fairy lights to lighten up the gloomy winter days, we also offer artificial Christmas trees from brands such as Black Box, and elegant Christmas decorations and baubles for your Christmas tree or interior from the Danish brand Sirius or the Swedish Konstsmide.